+ Show video of "Pinky and the Brain" - why study History. In groups of 3, students will be provided with a mini-whiteboard and whiteboard marker. We will all share our passion for history. D. Write why you chose that particular event. Students may use cellphones to find out some information about the event/person/place/etc. We will then present to the class. No longer than 30 seconds. Then we will try to put the events on a timeline with the boards around the room. Mr. Fitton will then summarize some of the events and provide observations. 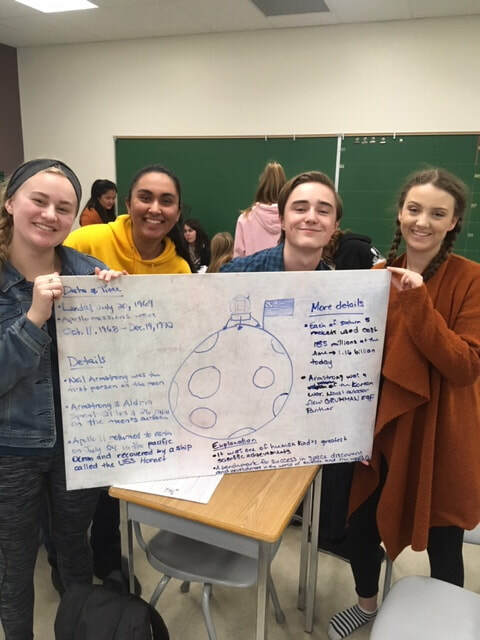 Please see below for student examples from this year! -Students must answer the following questions when done watching. Mr. Fitton will write them on the board so that they can think about them while watching. -What made it into this video and what did not? -What are the main messages in the film (history is linked; time is precious; time is long even though we think it is short). http://distractify.com/people/same-place-different-time/ - Tourists at historical locations with picture superimposed. -Explain to students that the time we are looking at is only 1919-2000. So, in the course of human history, it is a short period of time. We actually live in a time when people who created the events we will look at are still alive. 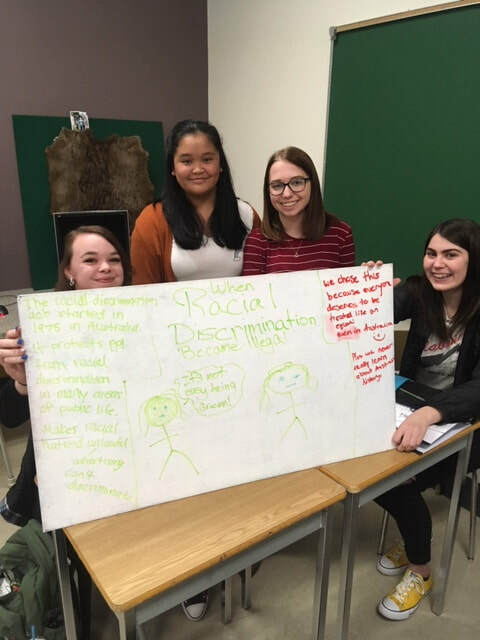 For instance, our school district was in contact with Martin Luther King Jr.’s daughter to come to Penticton. -These photos beg the question - the very ground you stand on has been the site of history. What happened there. What will happen there. Assignment: While watching the slideshow, the goal is to be critical and to start to think like a historian. Historian's have an incredible skill set. We will become Historians through building skills as the term progresses. You will no longer be students. (Students must jot down questions while we watch the slideshow - a list of sample questions is found below). 6. It is important to have these skills, or people will believe hoaxes, like the 49 hoaxes people believed in the video to the side. by John Greene, called "49 Hoaxes people believe." 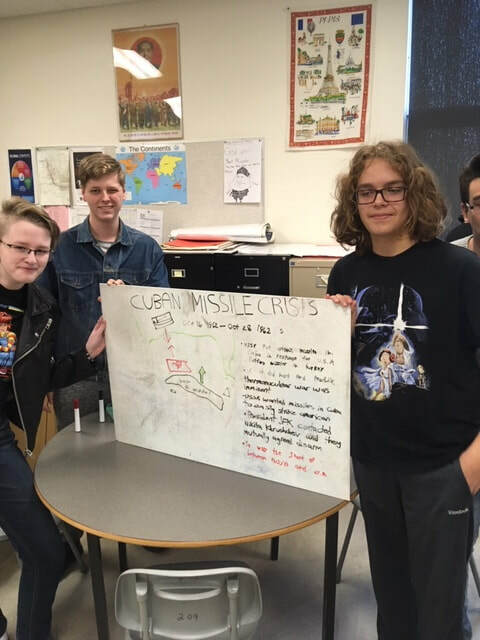 -Mr. Fitton will then tell them that this course is going to have some memorization of facts and events so that students can become experts in history and can have intellectual conversations. -However, the course is also about asking poignant questions and developing crticial thinking skills. -Why did they take that particular photo /from that angle / what are they emphasizing? -Does the photo show bias? -Why are there fewer minorities? -Why are most photos in black in white? -Why are most people in them white? -What is the goal of each photo? -What is the goal of the person showing us the slideshow? -Mr. Fitton then stressed the importance of asking questions and “problematizing” a situation. Do not simply accept knowledge to be able to spit it out. Do something with it. 7. Mr. Fitton distributed an “About me sheet”: Students fill out a sheet about themselves. To give to teacher so that he has a greater understanding of them. Also, lists ways to make this the best class of the year. Also, some questions ask us to design rules for the class. 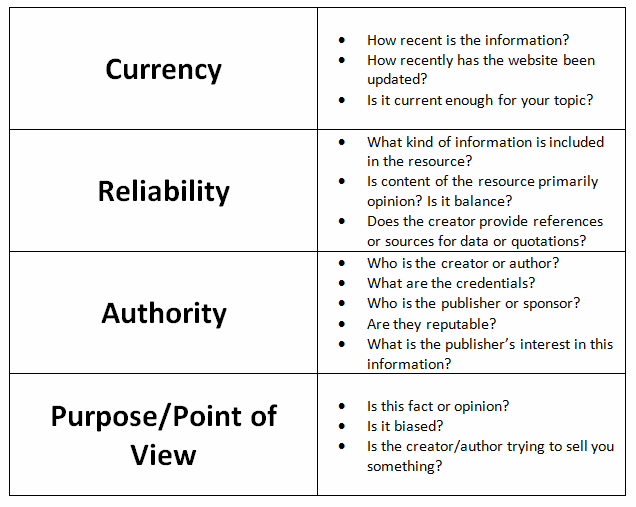 Assignment: Class discussion on the following questions. A. What are some of the historical allusions in the film (Stock Crash, Nazi's, KKK, etc) Can we find 20? B. What is the visual artist saying about humanity throughout history in the video? 9. Similarly, as Historians, would we have any issues with the video below called "Top 10 Influential Leaders of the Last Century." What questions would we have? Do you agree with this overview? Lessons 3 - 4 (February 3-4) - Observation, Skills of a Historian, Historiography, Document based question analysis. 1. Sherlock Holmes Activity . Explain to students the difference between seeing and observing. History is about looking at something a different way to expose ideas. (see handout below) This is a continuation of our last lesson where we have started to develop our historian skills. -Have students first guess the answers on the sheet and then have them go out and find the right answer (5 mins). Discuss as a class. 2. On rear of Sherlock sheet are notes on document based questions. 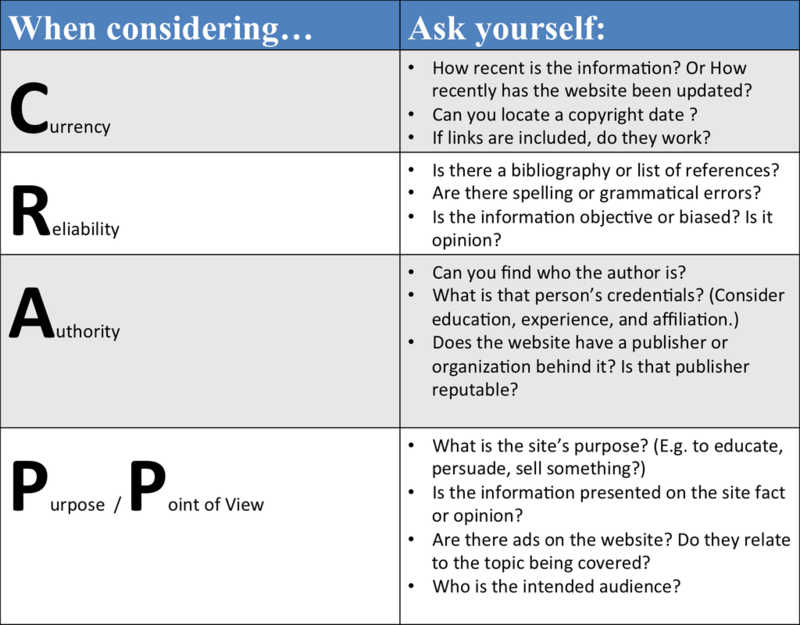 Take the notes from the Document Based Questions. These answers will be posted around the room. Then Mr. Fitton will distribute some DBQs for students to complete. Use the information from the notes to respond to the questions. 3. -Mini-Lesson on the question about Bias. As a class, we will discuss the concept of bias. Watch the video clip on bias called "The Subconscious Racial Bias in Children." -Class discussion on the content. Activity: Bring students up (choose a soccer player, someone who hates soccer, and someone who has never played - we will assess reliability as a class). 6. Work on the Document Based Questions. A. First, we will read over the document based questions as a class. C. Commence working on the DBQs. We will have class time to work on them over a couple of days. (Two 30 minute chunks; then due for homework if not completed). Students may work with partners. 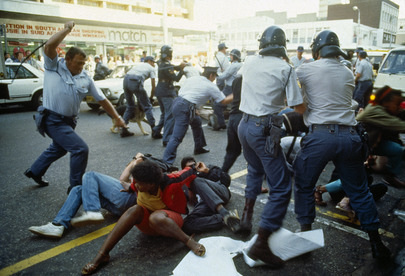 A picture showing the brutality of South African police, who were at times equipped with a whip. What is particularly awful about this photo? 1. 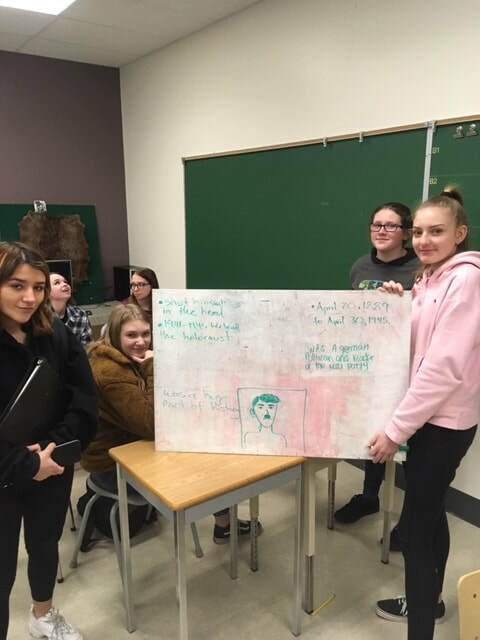 Class discussion: What are some of the skills that we have either learned or practiced this week through the activities that we have engaged in? E. Applying knowledge from a variety of fields. H. Asking probing deep questions. -Stop video periodically (every two minutes) and kids have to say five facts from their own knowledge that compliment the crash course info. Must add a fact that he does not include. -We could also look at History of WW1 oversimplified. -Class will then go over the answers. 4. Discuss societal/culture impacts that WW1 had on art/society. Discuss Otto Dix and new types of art that did not reflect Victorian era. -Mr. Fitton will print sections of both slideshows. 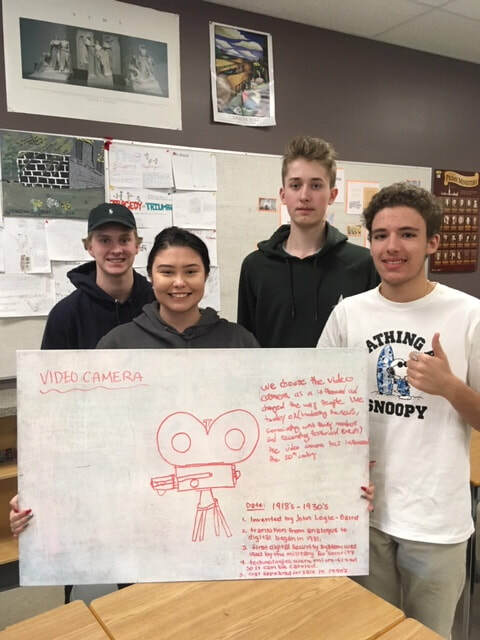 In groups of three, students will meet to come up with observations and notes, questions, comments that they will have to bring up while Mr. Fitton shows the slideshow - this is to provide students with a chance to see the material first so that the slideshow is more interactive. 5. Existentialism Lecture. Discuss Existentialism (see notes on the art assignment). A whole new philosophy resulting from the war. This is "Intellectual history" as well as Social and Cultural history. Goes with the video clip "God is Dead" by Kids in the Hall. 6 - We may also watch a video called "Gooooodbyeeeee" From Black Adder which shows the concept of fatalism and Trench Warfare. 7. ASSIGNMENT: Distribute art assignment. Students can type or write by hand. Provide laptops and ipads for students to use. Do in groups of two. 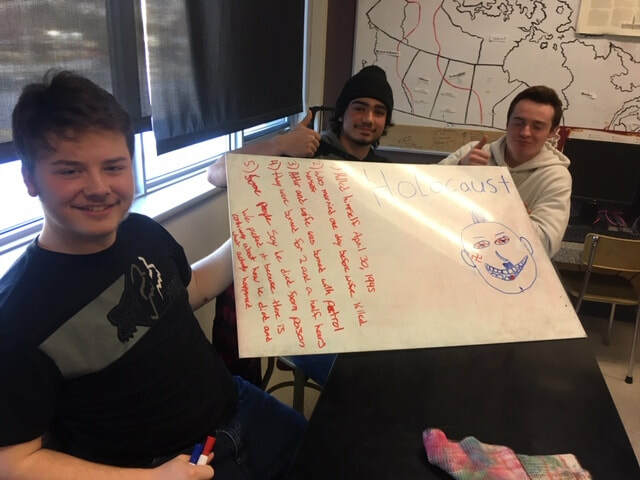 See assignment below. 8. 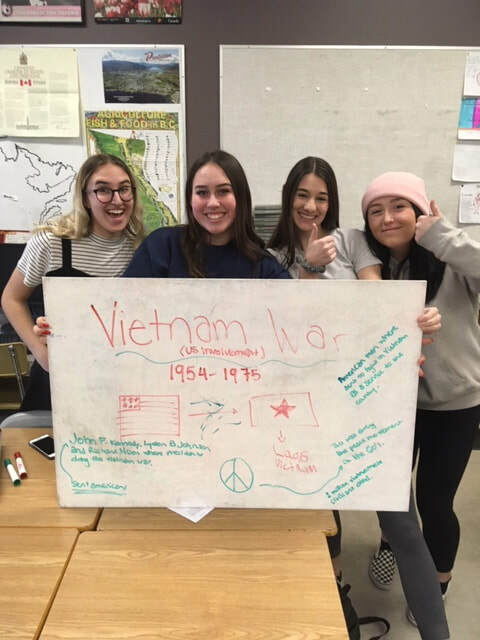 After we completed the assignment, we did a gallery walk, where each project was placed on a whiteboard, students went to at least three other whiteboards and commented on recurring themes, or what was powerful. We played some smooth Jazz music at the request of students as we conducted our gallery walk. See below for some student samples. They are better than the teacher examples appended to the rear of the handout. Below - Please Find examples of notes taken by students throughout the term. They may assist you in your studying.